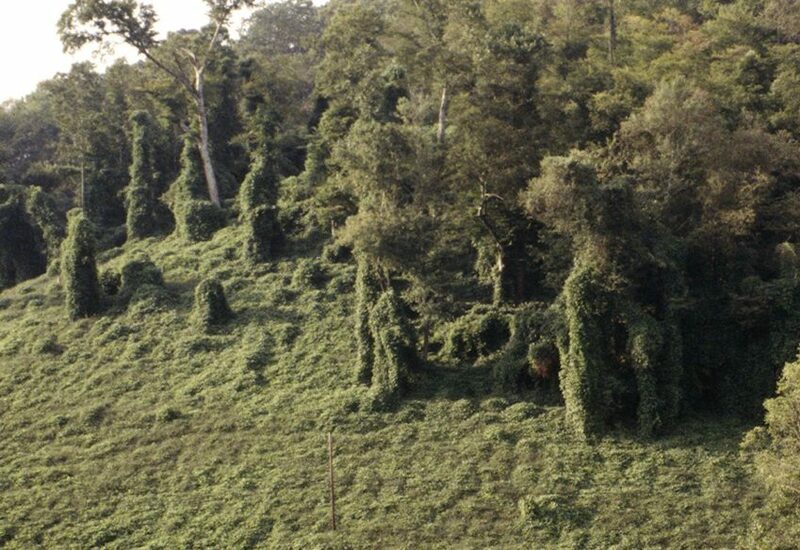 The Invasive Terrestrial Plant Rule was signed by Governor Holcomb and published on March 18, 2019. the rule goes into effect 30 days after publishing, so it will be effective in April. 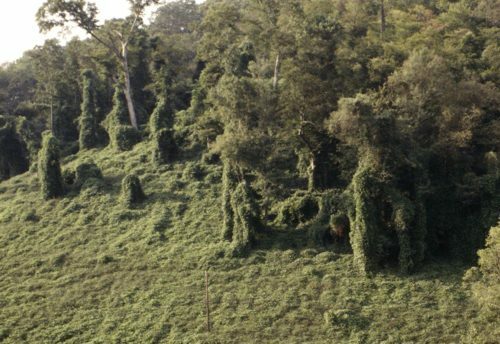 with respect to the 44 invasive plant species (see full list in the Landscape Report). To learn more about what an invasive species is, what damage they do, what Indiana is doing, and more please read the Landscape Report, Terrestrial Invasive Species Rule Signed by Indiana Governor. 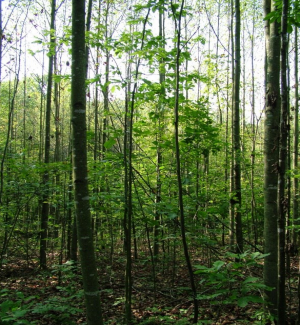 The Indiana Tree Project has long been dedicated to expanding Indiana’s hardwood forests. They have partnered up with Natural Resources Foundation and the Division of Forestry to celebrate Arbor Day and Earth Day and help reforest Indiana. Limited edition tree shirts are now being sold. 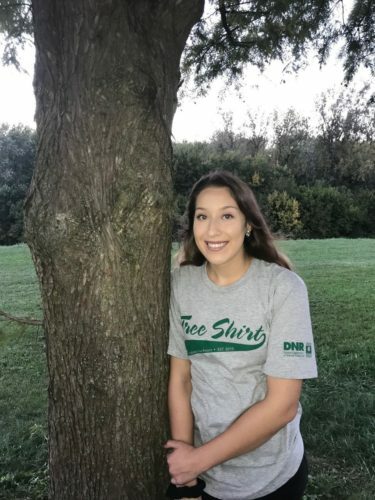 For each shirt purchased, two trees will be planted and you will be given an official tree certificate with a unique tree ID. This ID is used to pull the coordinates for the acre where the tree will be planted. The types of trees planted are native Indiana hardwoods and typically upland and bottomland oaks, walnut, black cherry, and other species that are in need of restoration. Please visit the Indiana Tree Project to learn more about how trees help wildlife, prevent soil erosion, and support our state’s largest agricultural industry. Purchase your limited edition tree shirt and help restore Indiana’s forests today. If you are interested in participating in the next public tree planting, please email champton@dnr.IN.gov to receive updates. One of the most dangerous pests to trees is a human, especially with equipment. Injuries to trees caused by a lawn mower or weed trimmer can seriously threaten a tree’s health. 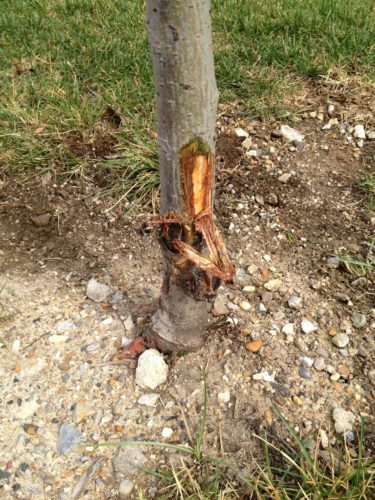 Additionally, damage to the bark layer of trees causes a long-term liability by creating a wound which leads to a defect, becoming an unsafe tree. Any type of damage or removal of the bark and the transport system can result in long-term damage. Damage, which extends completely around the base of the tree called girdling, will result in ultimate death in a short time. Tree wounds are serious when it comes to tree health. The wounded area is an opportunity for other insects and diseases to enter the tree that causes further damage. Trees can be completely killed from an attack following injuries. Fungi becomes active on the wound surface, causing structural defects from the decay. This weakens the tree or it eventually dies, creating a risk tree to people around it. Trees are a major asset to your property and important to our environment. Protect our trees and preserve these valuable assets by staying away from tree trunks with any mowing or weed trimming equipment. The damage lasts and it cannot be repaired and often results in losing your tree. For more information on tree damage repercussions and how tree harm can be avoided, please refer to the full article from the Landscape Report, Equipment Damage to Trees. The Woodland Wildlife Steward workshop will be June 7-9 at Morgan-Monroe State Forest in Martinsville, Indiana. Purdue University Extension is hosting the program in collaboration with the Indiana Department of Natural Resources’ Division of Forestry, and Fish and Wildlife; National Wild Turkey Federation; and Indiana Forestry Educational Foundation. About 3.5 million acres – or 73 percent – of Indiana’s forestland is privately owned by individuals, making the management of these areas important for wildlife, said Jarred Brooke, a Purdue Extension wildlife specialist and workshop organizer. The workshop will cover various aspects of wildlife ecology and the relationship between wildlife and forest stewardship. Those attending will participate in indoor presentations and activities, outdoor field exercises, and site visits. There also will be opportunities to network with natural resource professionals and other landowners. The Woodland Wildlife Steward workshop begins at noon Eastern time on June 7 and runs through 3 p.m. on June 9. It will take place at the Morgan-Monroe State Forest Training Center, 6220 Forest Road, Martinsville. Workshop enrollment is limited to 30 landowners, and limited lodging for participants is available on site. All workshop fees include electronic copies of course materials and transportation to and from field sites. Meals included in the workshop fee are breakfast and lunch on June 8 and June 9, and dinner on June 7 and June 8. * Traveler, $150. In addition to workshop materials and meals, this fee includes lodging at Morgan-Monroe State Forest that consists of rooms with one set of bunk beds, a communal kitchen area, and shower and restroom facilities. * Family member, $50. One additional family member may attend at this rate with another registered participant. The fee includes all workshop materials and meals, as well as lodging if attending the workshop with someone registered as a traveler. The deadline to compete a workshop application is May 1, and those accepted will be notified on or shortly after the deadline. Workshop information and a link to apply are available at https://www.purdue.edu/fnr/extension/calendar/woodland-wildlife-steward/. Those with additional questions can contact Brooke at 765-494-8459 or jmbrooke@purdue.edu. Purdue University’s Tick INsiders program is looking for Indiana high school students and other Indiana residents willing to roll down their sleeves to get involved in a citizen science project. Cate Hill, a Purdue professor of entomology, leads this effort to analyze the bacteria and viruses in Indiana’s ticks to build an understanding of what they are carrying and how that might impact human health. To do that, she needs volunteers to collect ticks from all over the state. This year the Tick INsiders program will provide training for up to 50 students. 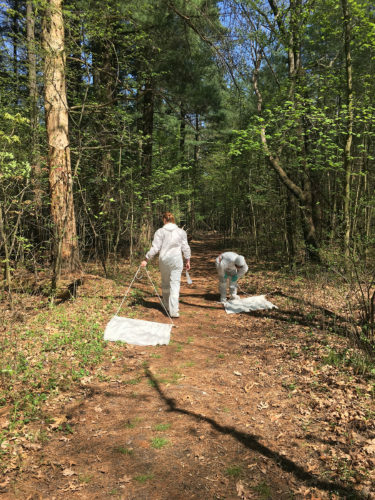 Citizen scientists are also now welcome to collect and send ticks to Hill’s lab. Three species of ticks – the blacklegged or deer tick, the lone star tick and the American dog tick – are found in Indiana. These ticks can transmit multiple pathogens, nine of which are known to cause human illnesses, though not all have been identified in Indiana. The Indiana State Department of Health reports more than 100 cases of Lyme disease each year and dozens of cases of Ehrlichiosis, anaplasmosis and Rocky Mountain spotted fever. Research suggests that ticks can carry a cocktail of microbes – bacteria and viruses – that can sicken bite victims and may work in concert to affect the severity of an illness and human immune response. Indiana residents interested in participating can collect ticks and send them to Hill’s lab for analysis. Videos on safe and proper collection techniques, as well as how to send ticks will be at Tick INsiders. For full article, see Purdue Agriculture News. Mosquitoes and ticks – little pests carry big risks, Got Nature? 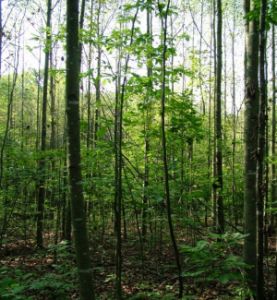 Forest management in the eastern United States is faced with many modern challenges. Professional foresters have an innovative set of management options for the maintenance of healthy forest ecosystems. But some options raise public objections when applied to public lands (e.g., types of timber harvest, prescribed fire) and the effects of some management options on forests and their native inhabitants are poorly understood. Moreover, forest lands in the eastern and Midwestern United States primarily are in small privately-owned parcels that change ownership relatively frequently. These lands are often managed for short-term financial gains rather than long-term sustainability. As populations of some forest organisms decline, restrictions on landowners may increase because species become classified as endangered or threatened (e.g., the Indiana bat), while increasing populations of other species (white-tailed deer, invasive plants) create economic and ecological challenges. These problems are compounded by the lack of scientifically rigorous research on the overall impacts of forest management on the effected ecosystems and their components. To address this set of issues, the HEE, a long-term, large-scale experimental study of forest management and its impacts, was initiated in 2006. Many of Indiana’s forests have been dominated by oak and hickory trees for thousands of years. The historical conditions that shaped today’s forests have changed, altering forest composition and leading land managers to wonder what can be done to maintain oak and hickory forests for the future. 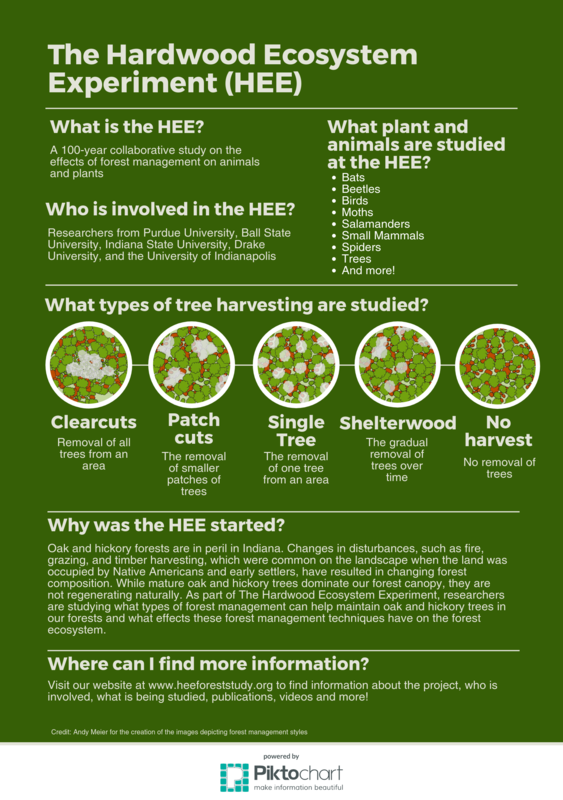 The Hardwood Ecosystem Experiment: 2006-2016 provides an overview of findings for the first 10 years of the HEE, 100 year project. To learn more about this 100 year forest management plan and see its impacts, check out the Hardwood Ecosystem Experiment website. If you would like to start receiving “The HEE Update,” please email Charlotte Owings, the HEE project coordinator, at freemac@purdue.edu. If you do not have an email address, you may still receive the newsletter by regular postal mail – call Charlotte Owings at 765-494-1472. Empty cage trap with door open. Image taken by Doug Beckers and courtesy of flickr.com. Having raccoon, groundhog, or other bothersome wildlife problems? Thinking about setting traps to catch these vermin? There is much to consider when using traps, please take a look at the latest pub before setting any box traps around your property. 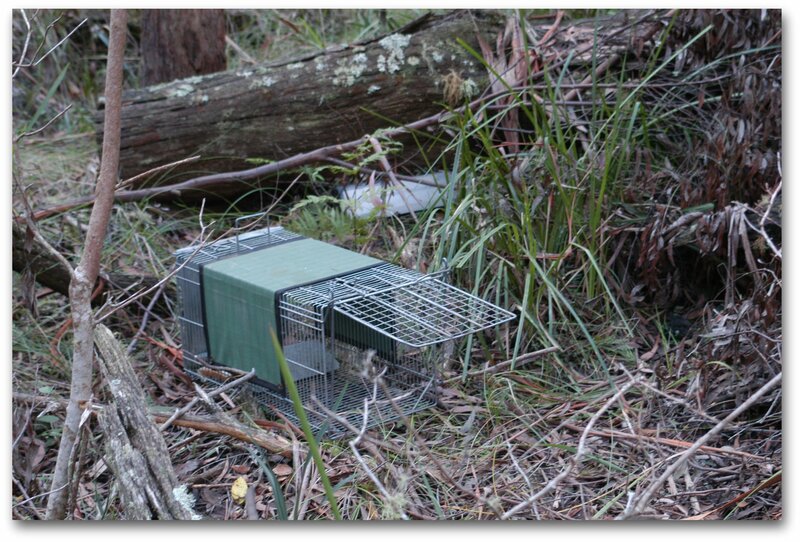 Wildlife specialists Brian MacGowan and Rick Shadel have collaborated to bring you this new publication: Considerations for Trapping Nuisance Wildlife with Box Traps. Homeowners commonly set traps to capture and remove wildlife from their home or yard. Setting a box trap improperly can decrease their effectiveness and even lead to safety risks to both people and wildlife. The purpose of this publication is to 1) outline the legal and ethical factors homeowners should consider before setting a trap, 2) review the basic procedure for effectively trapping wildlife, and 3) help you to determine the fate of the captured animal. If you have a serious, dangerous, or a nuisance wildlife issue, you may want to consider hiring a professional. Consider reading this publication before deciding whether or not you need to hire a professional: Selecting a Nuisance Wildlife Control Professional. National Invasive Species Awareness Week kicked off on Feb. 25 (Monday) and runs through March 3 (Sunday). The campaign is designed to enhance awareness about invasive species and encourage reporting of invasive species from what Purdue University entomology professor Cliff Sadof calls “citizen scientists.” This includes people who spend time professionally or recreationally in the outdoors and is interested in learning about invasive species. A major tool in the fight against these species is the Report Invasive website, hosted by Purdue College of Agriculture and the Indiana Invasive Species Council. The website includes several ways that people can report invasive species, including a smartphone app from the Great Lakes Early Detection Network. Please report any invasive species you come across including insects, plants, and animals to Report Invasive Species. For full article see Citizen scientists-report invasive species, Morning AgClips. For license information, youth hunting information, private land permission form and more check out IDNR Hunting and Trapping. 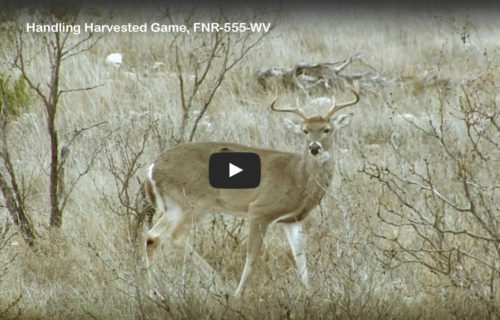 Click the image to be redirected to Handling Harvested Game.